Combining my passions for bicycle touring and Greece, I recently completed a one week cycling holiday that started and ended in Athens. I've shared my experiences here for anyone else who would like to try cycling in Greece. Not into cycling? Don't worry! You could just as easily follow this route as part of a road trip in Greece. It takes in a few major attractions along the way, and also one or two places that many people travelling to Greece might skip. As I live in Athens, I decided to plan a cycling route that would start and end in the city. With only a week, I wanted a route that combined a couple of challenges with interesting places to see. In the end, this is what I came up with – Planning a one week cycle tour in Greece. I pretty much followed this route exactly, and it worked out well. The only drawback was it didn't quite leave enough time to see some attractions such as Delphi. For me, this wasn't a major issue, as I have been there before. Anyone else considering this route for cycling in Greece should probably think of extending the tour from one week to 10 days though. This would leave time to see Delphi, have a day off the bike, and also see the main points of interest in Athens. Day 1 of the cycling trip saw me leave Athens, and head to the coastline at Marathon. I saw a couple of archaeological sites there, and then headed up into the hills around Afidnes. A reasonably challenging first day on the bike, especially due to the hot temperatures! Cycling down out of the hills, I continued cycling towards Thebes. A major power centre in ancient times, it has an archaeological site which I found interesting. Whenever you visit a museum in Athens, you would think that Athens was the centre of the universe in ancient Greece. It was good to see a different narrative! A 70 km cycle ride to the coastline near the town of Livanates. I passed by some interesting looking rock formations along the way, with some minor battles against the wind and heat. For anyone planning on cycling in Greece, I would say there are two things not to underestimate. The terrain, which can be hilly, and the heat, which can reach 40 degrees during August! After one of the best breakfast ever, I continued my journey of cycling in Greece to the town of Loutra Ipatis near Lamia. Along the way, I stopped at the monument to Leonidas and the brave 300 at Thermopylae. 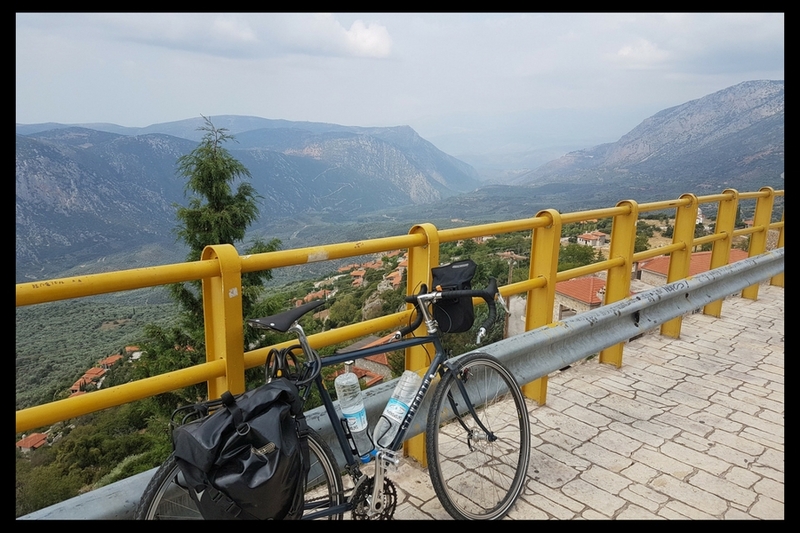 This was the toughest day of the bike tour in Greece, covering over 100 kms in distance and 2000 metres of total elevation gain. The views along the way were spectacular though, and I arrived in Delphi safe and sound. Surprisingly, Delphi has very affordable accommodation, and I picked up a room for 20 Euros for the night. If I was to plan this trip again, I would have scheduled a day off in Delphi in order to have a break from cycling, and to see the archaeological site in full. There was still a reasonable amount of uphill riding during the first part of the day as I cycled up to the pretty town of Arachova. There are some wonderful views from up there, and on leaving, it was basically all downhill back to Thebes! The last day of the bike tour in Greece closed the loop from Thebes and back to Athens. I had half hoped that I would have time to cycle around the historic centre of Athens, but it didn't work out that way. As mentioned earlier, if you are planning your own cycling trip in Greece based on my itinerary, you might want to take this into account. It had been a hectic year for me up until this cycle tour, and as a result, I had done little to no training for it. Still, apart from a couple of sections, the route was easy enough on my legs. As mentioned in a couple of the videos, I would strongly suggest choosing any month other than August (unlike me!) for cycling in Greece. Whilst the traffic was reasonably quiet during this time, the heat was pretty strong! Greece is one of my favorite countries. I am fascinated by Greek mythology and history and am captivated by places like Athens and Delphi which have a rich history and heritage. Add to this the pleasure of cycling across this beautiful terrain, it must indeed be a blissful experience. That’s a lot of steep bicycle climbing! I’ve been to Delphi, and I can’t imagine riding a bike there! But what an interesting tour, and I imagine it was very much worth all the hard work to see the views and then enjoy the downhill stretches! This is so interesting to watch. I confess that i did pass through some of the “along the road” sights and focused on the views and spots of interest. Thanks for the tips and the very friendly production. Thanks! 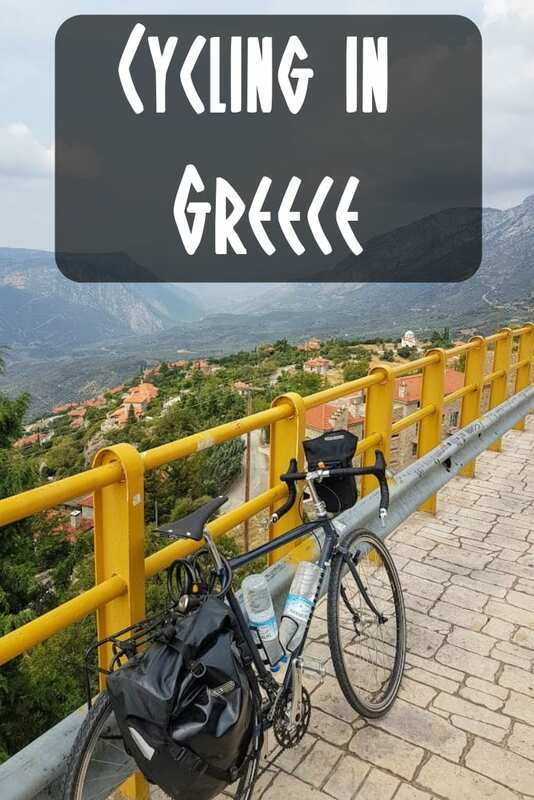 This route cycling in Greece was a really enjoyable one to take, and as you say, many sights to see along the way!